Discover interesting facts and information about the weapons, including the Poisoned Arrow, used by Native American Indian tribes. Description and Definition of a Poisoned Arrow: A poisoned arrow is the term used to describe arrow heads or darts that have been dipped in poison for the purpose of hunting or Native American Warfare. Poisoned arrows are associated with the indigenous people of South America but there were some tribes of Native American Indians who also used poisoned arrows. The tribes of South America used poison from the Golden Poison Frogs - the South American Poison Dart frogs are the most toxic source of deadly poisons and secrete toxins through their skin. The poison obtained from the poison dart frogs was only available to the tribes of Central and South American - so where did the Native Indians of North America acquire the poison used for darts and arrows and how did they use poisoned arrows? The weapons used by Native Americans to shoot a Poisoned arrow were the Bow and Arrow and the Blowgun. 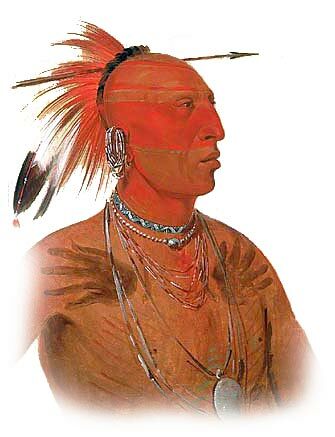 Various tribes made use of the Poisoned Arrow in hunting and warfare, notably the Apache, Navajo, Paiute and the Diegueno Indians of California. However it should be noted that this was not a common practice. 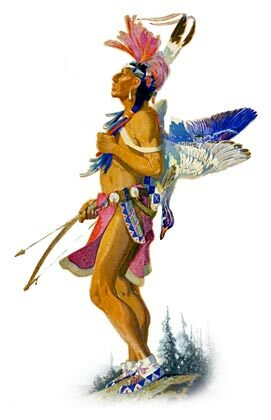 The Native American Indians were so skilled with the bow and arrow that any enhancement to the basics was normally unnecessary but a poisoned arrow would have been seen a strong 'medicine'. The Cherokee and a few other tribes of Native Americans used Blowguns with poisoned darts. The poison used by Native Americans for the poisoned arrow or dart was obtained from either reptiles or from extracts from various plants. The reptiles that contained poisons were different types of poisonous snakes and even Gila Monsters. To obtain venom from a rattlesnake the reptile was irritated until it repeatedly struck into the spoiled meat or liver of an animal, impregnating it with its toxin. Poisonous snakes were also induced to bite into the meat or liver. The tips of arrows or the blowgun darts were then dipped into the poisoned meat. The Gila Monster is fairly common in the southwest USA. 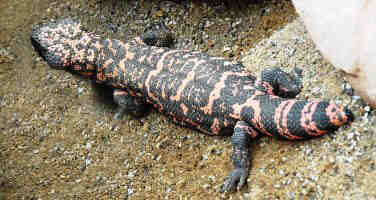 Gila Monsters and the Mexican beaded lizard are the world's only known venomous lizards. The Gila Monster has poison glands in the lower jaw, and it does not inject its venom as a snake does. The Gila Monster needs to bite and chew to break the skin so venom is absorbed. Once again the Native Indians would induce the lizard to to bite into spoiled meat or liver. Extracts from plants were also used to obtain poison for arrows. Many tribes used used extracts of yew from bark and needles as Arrow and Spear poisons. The Apache dipped their arrows into the sap of the Yucca to make a poisoned arrow. Other tribes used used extracts of yew from bark and needles as arrow poisons other used the American Golden Poppy, Bloodroot and Datura. To make a poisoned arrow from a plant extract the sharp edges of the poisoned arrow were either dipped in the sap of the plant or boiled in water to obtain a poisonous liquid. Native Americans also used Veratrum (commonly known as false hellebore and corn lily. The juice of this plant pressed from the roots to poison arrows before combat. The deadly poison used for the Poisoned Arrow was stored in special cone-shaped clay containers that were stored in the bottom of quivers. The poisoned arrow would only have the poison added at the time the arrow would be used. 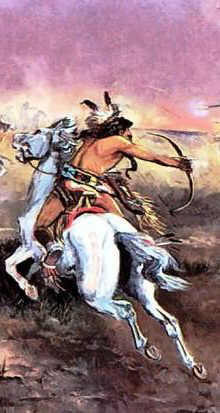 Native Americans were able to make one shot with a poisoned arrow every 3-4 seconds at a range of about 200 yards. The Poisoned Arrow. Discover the interesting facts and information which relate to the History of Native Americans and the weapons they used such as the Poisoned Arrow. The pictures on this site show the weapons and tools that were used by various Native Indian tribes that can be used as a really useful educational history resource for kids and children of all ages. We have included pictures and videos to accompany the main topic of this section - Poisoned Arrow. The videos enable fast access to the images, paintings and pictures together with information and many historical facts. All of the articles and pages can be accessed via the Native Indian Tribes Index - a great educational resource for kids providing an unusual insight into their culture.